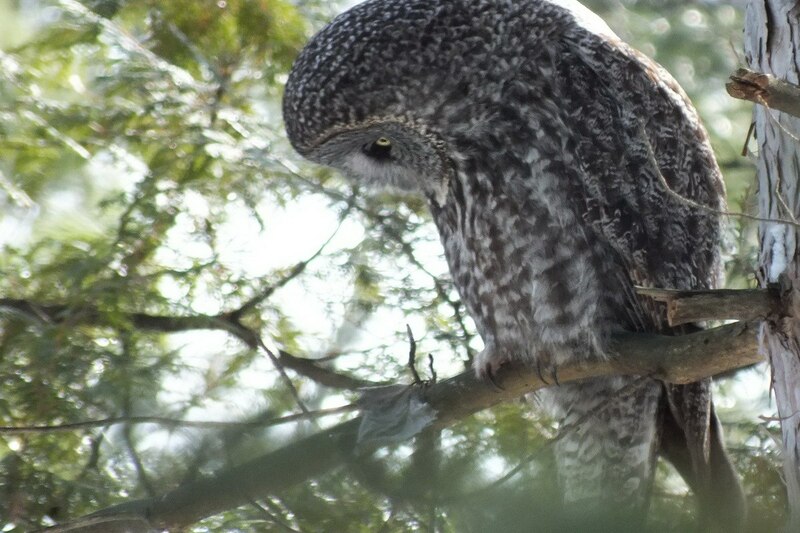 On a warm winter day, Bob and I lucked out and managed to sight this Great Grey Owl in a forest south of Ottawa, Ontario, Canada. On a whim, we had returned once again to Ottawa, Ontario, to enjoy skating on the frozen Rideau Canal. This would be our fifth visit to the city, over a number of years, for the famed winter carnival. 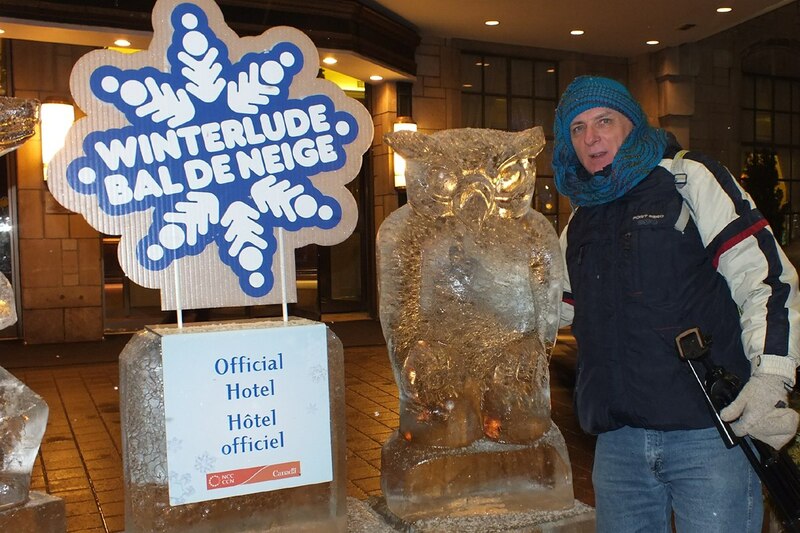 Given our interest in bird watching, we couldn’t pass up the opportunity to snap a picture of this handsome owl carved out of a block of ice. 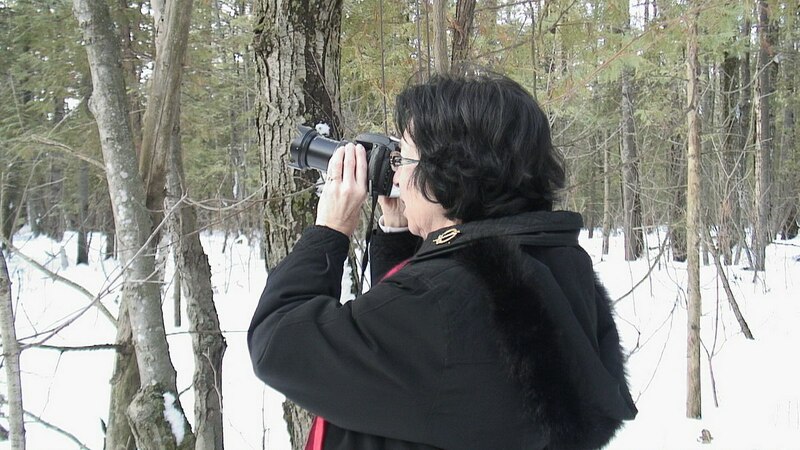 On our third day in the city of Ottawa, Bob and I decided to check out a greenbelt along the Ottawa River because we had heard that a Great Grey Owl had been sighted in the woods there. 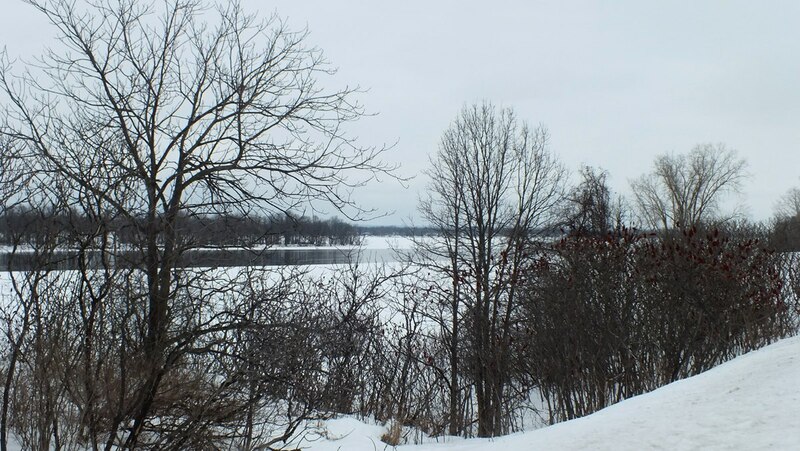 As we drove along Rockcliffe Parkway, it surprised us to see open sections of water in the river, but there is a swift current that prevents the center of the waterway from freezing. 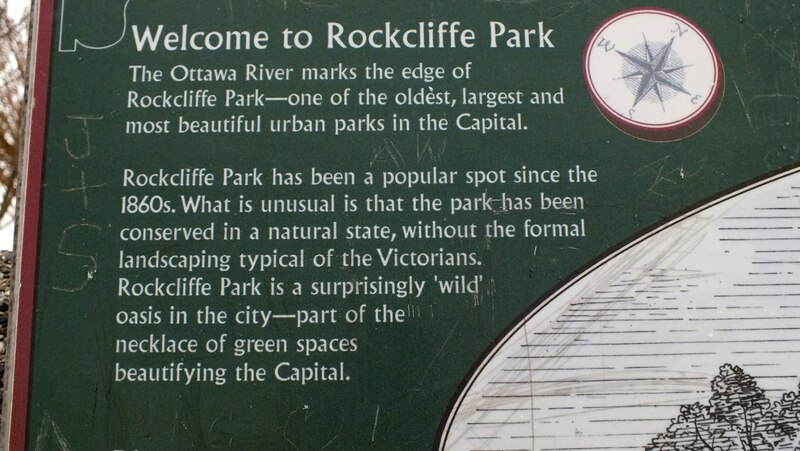 A lookout provided along the route to the urban park displayed several signs that tell the history of the area. 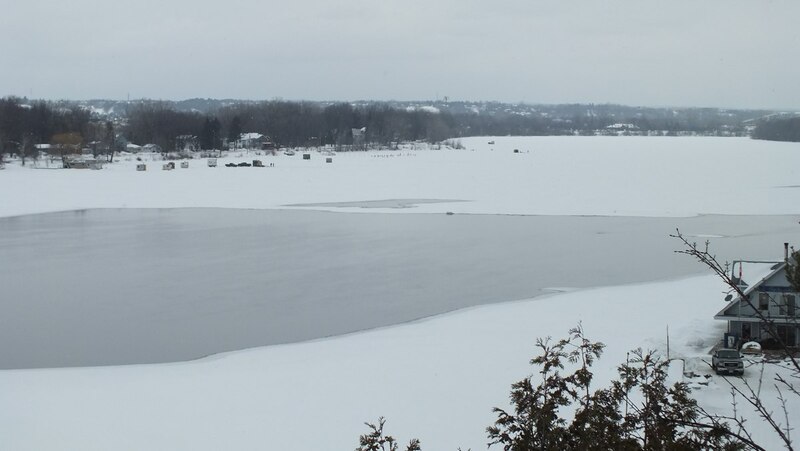 Even with open sections of water in the middle of the river, fishermen had set up ice fishing huts all along the shore. 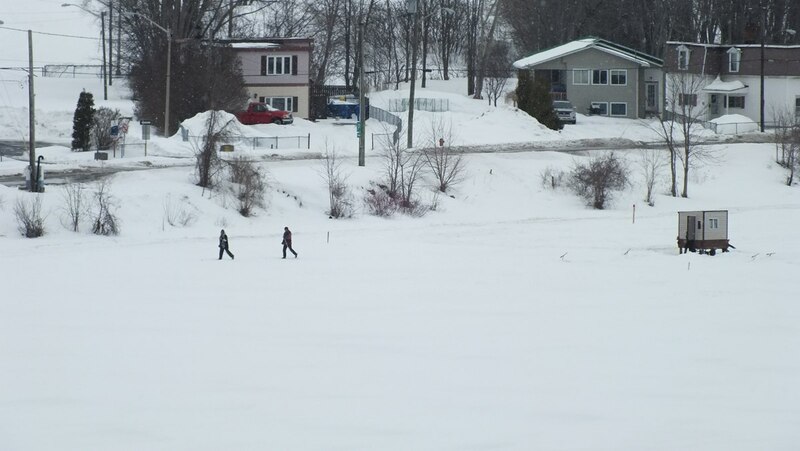 These two intrepid fishermen were engaged in cross-country skiing from their hut back to the edge of the river. 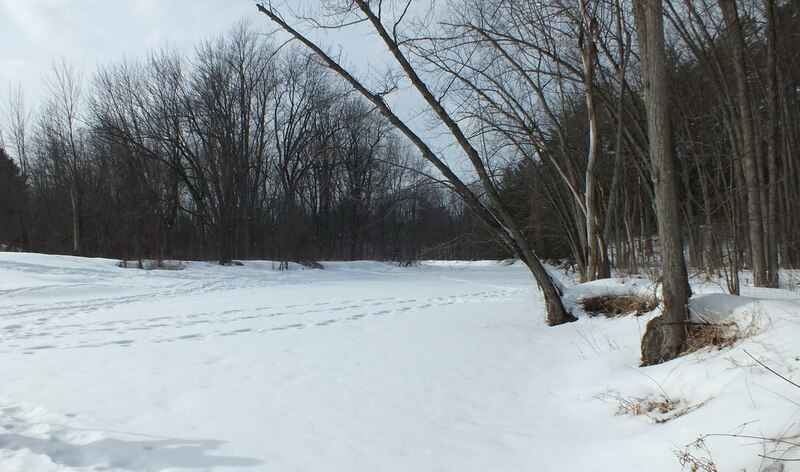 After we parked our car along Rockcliffe Parkway, Bob and I trudged through the deep snow into and through a mixed evergreen and deciduous forest and across a frozen creek bed. 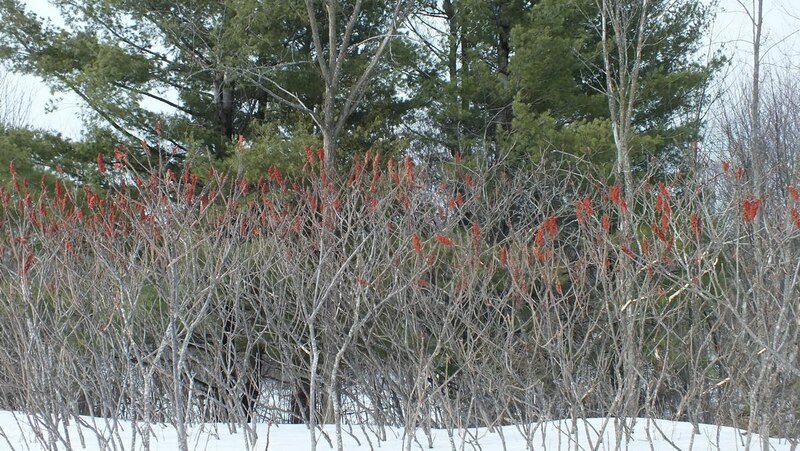 In amongst the Staghorn Sumac (Rhus typhina) and pine trees were signs of ample wildlife, judging by the tracks in the snow, and the twittering of various birds as they flitted amongst the branches. 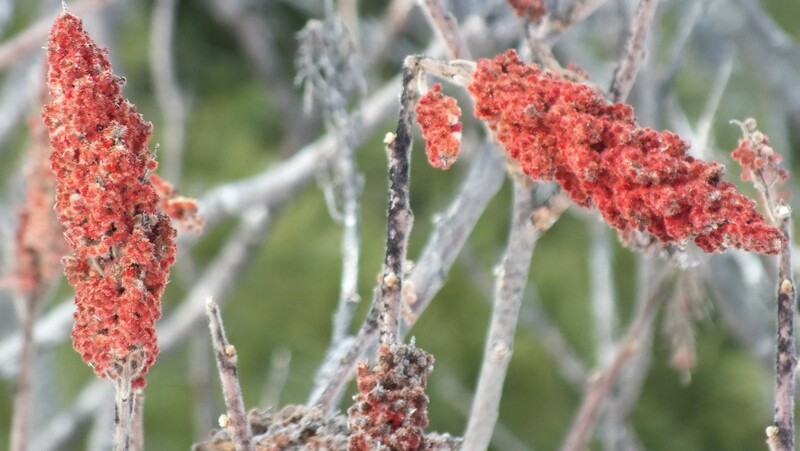 Although the flowers of sumac are fairly unremarkable, come autumn, the fruit turns to shades of red, rose and mahogany. 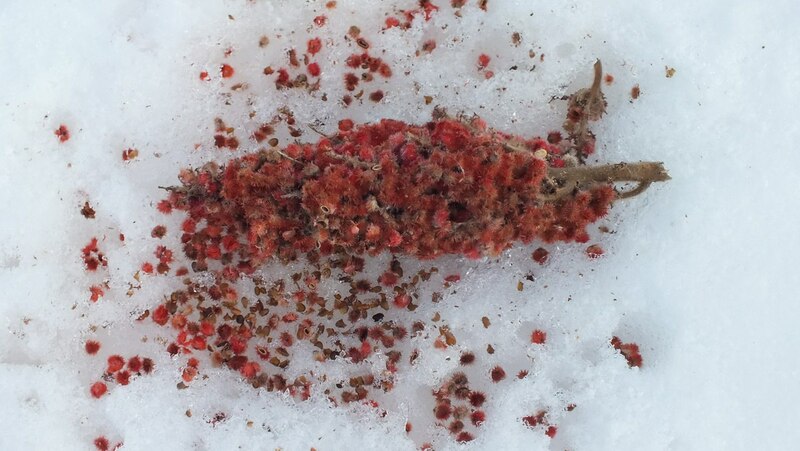 Numerous sumac bracts or drupes were strewn on the snow with evidence that some small creatures had been eating them. Tiny tracks were left in the snow leading to the sight of each one. Rabbits, birds, squirrels and mice all love to gorge on the energy-rich fruit during the winter months. I love the endearing sounds emitted by nuthatches, and even as Bob filmed the location, I could hear some of these birds in the vicinity. 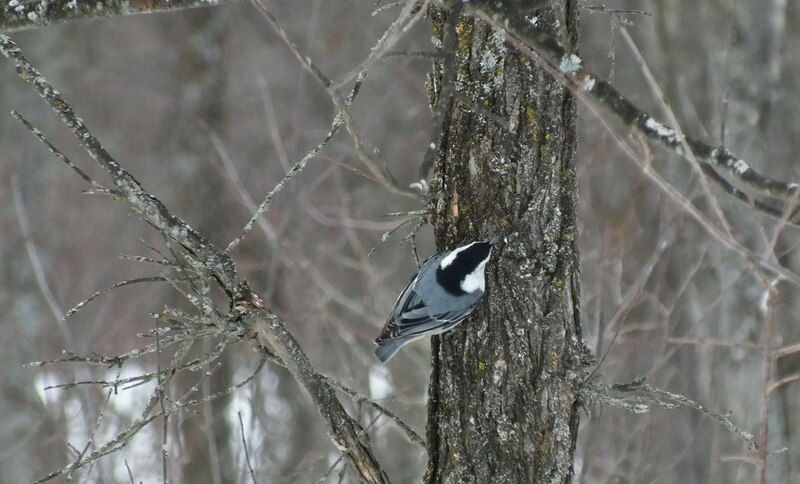 I was pleased to spot a white-breasted nuthatch on a nearby tree trunk, but it repeatedly flew between the tree and a spot on the ground that seemed to hold an attraction for it and a number of Black-capped chickadees. 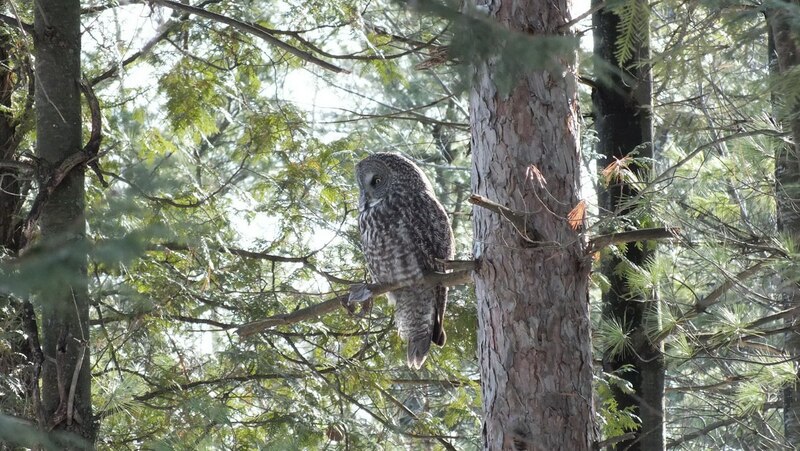 Deeper in the woods, perched silently in the dappled shade, is where Bob and I located this Great Grey Owl. 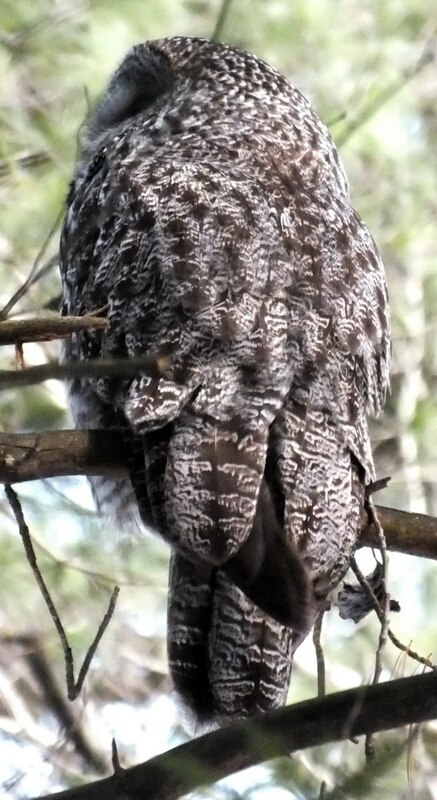 After hiking for about a half hour, we were thrilled when we picked out the profile of the owl where it roosted on a branch about midway up a tree. We made a point of keeping our distance and letting our lens do the work for us! As the owl peered into the distance, I wondered what had caught its interest. A couple of crows were making themselves known, so perhaps the owl was on alert to their potential intrusion. Or perhaps the owl had noticed some possible prey. 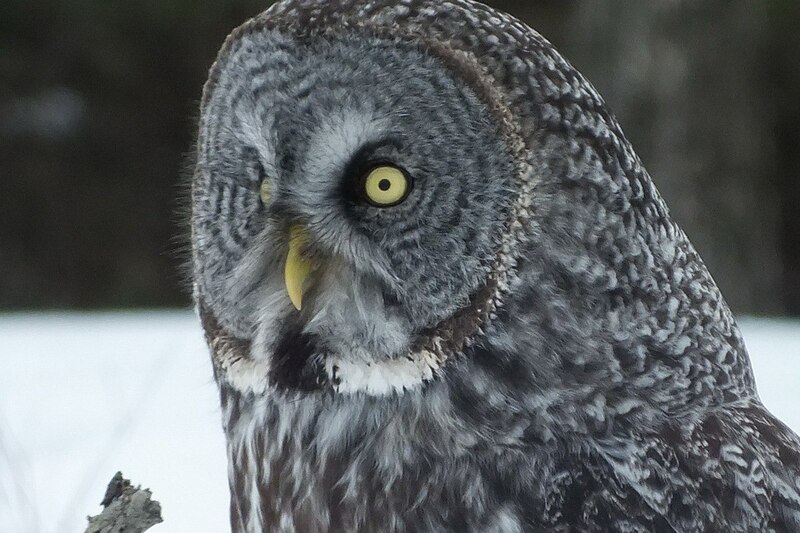 Great Grey Owls often forage during the daytime, especially during the winter. 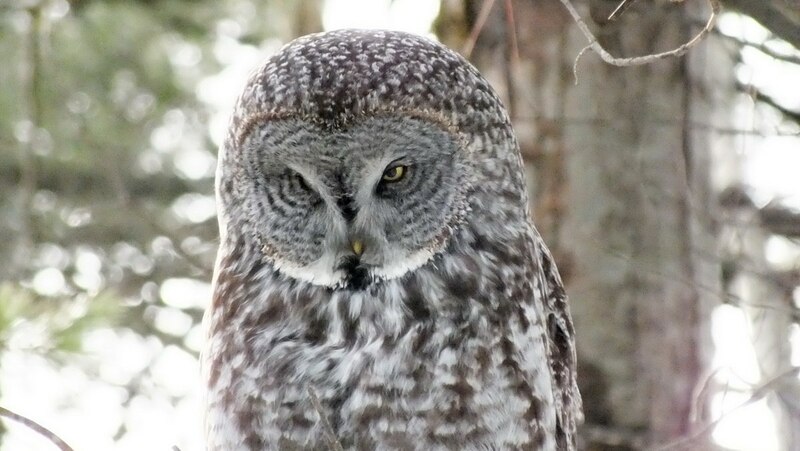 The camouflage provided by the Great Grey Owl’s plumage makes a perfect cover as it lurks in the trees waiting for some unsuspecting prey to pass by. The same can be said for all other owls that we have come across, too. 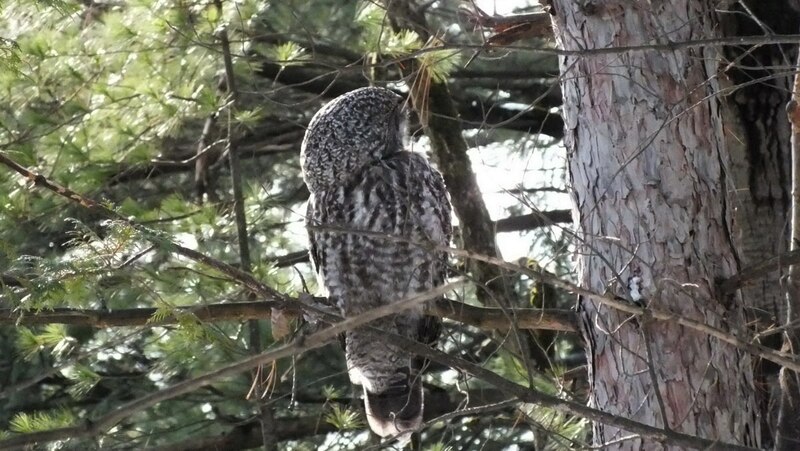 Bob and I cautiously took our leave of the owl, and then circled back behind it so as to have a view of its back. 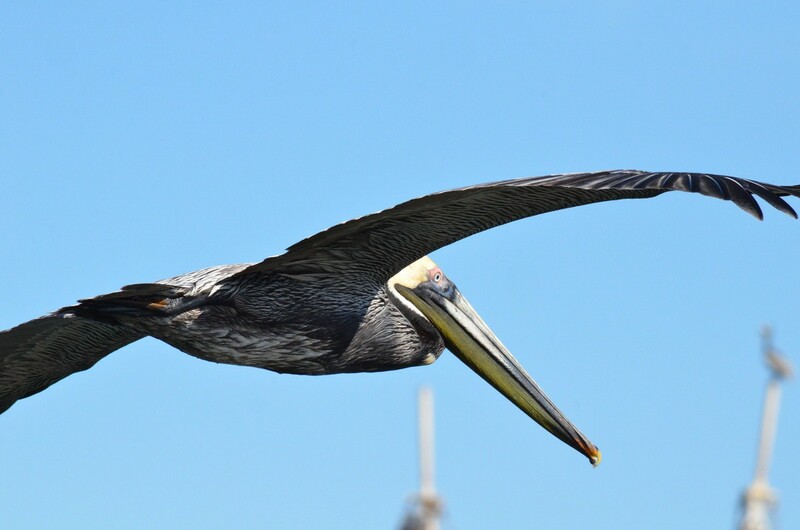 The color pattern on its wings is so intricate and makes the feathers almost iridescent in nature. 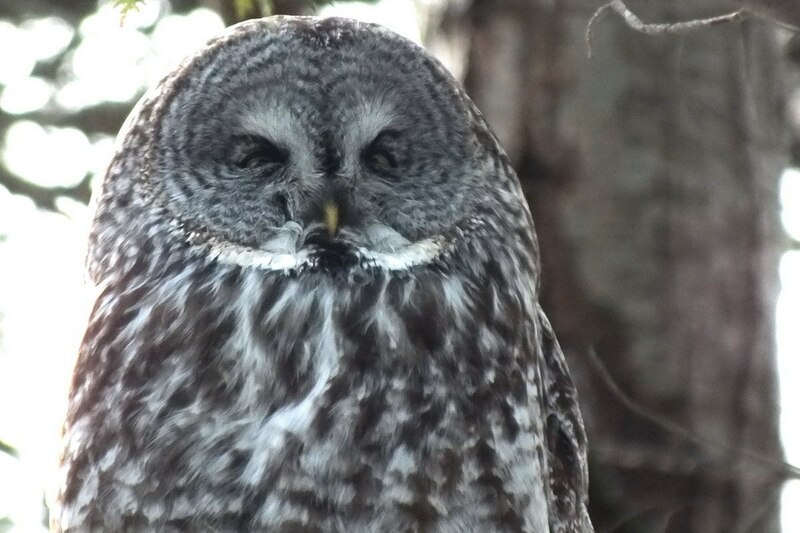 In are video the owl is acutely aware of us but continues to be relaxed as it preens itself. It was an unusually warm, sunny day allowing us to really enjoy the setting. 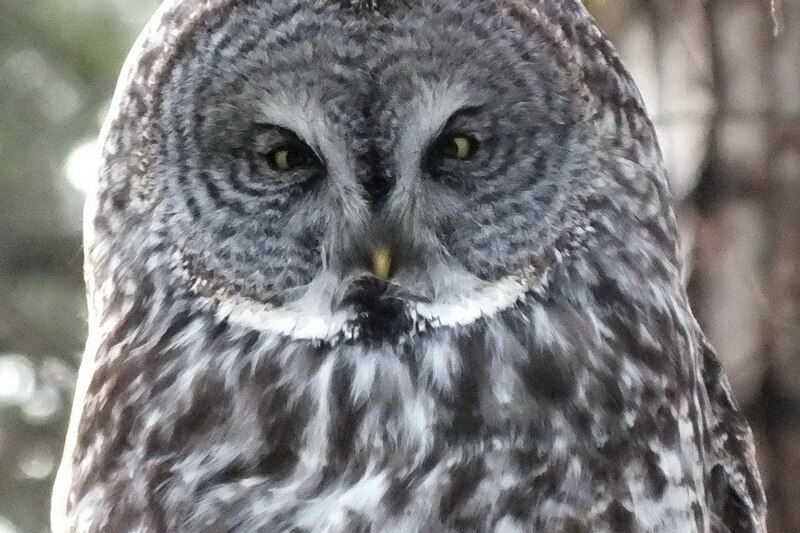 Great Grey Owls have a very large facial disc, conspicuous white throat markings and bright yellow eyes. What a majestic and wise looking bird! 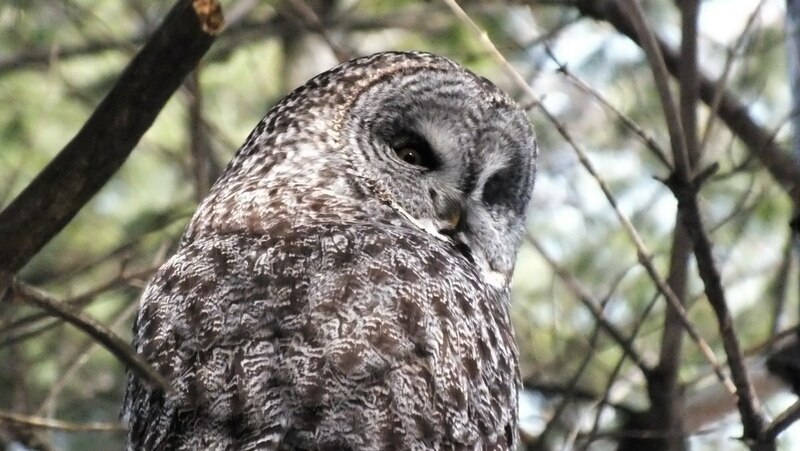 At times, the owl’s piercing gaze made even me feel uneasy. 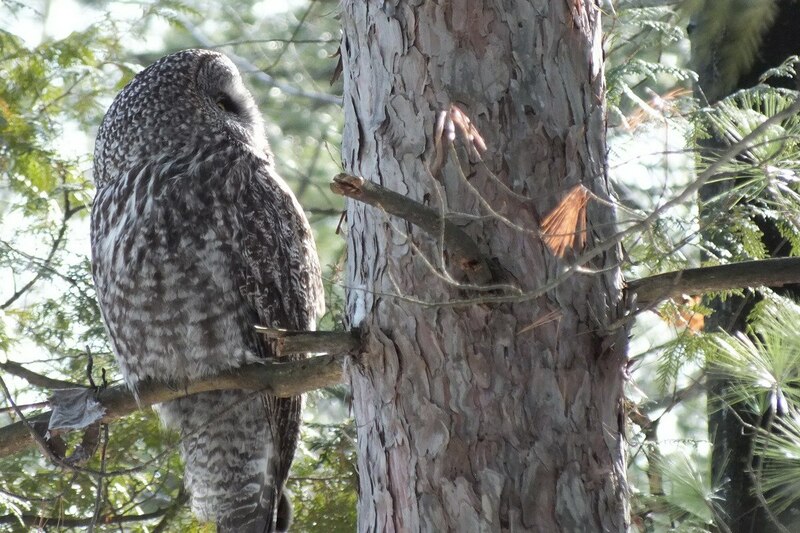 Bob and I observed the owl for about 45 minutes, but it was fairly content in its chosen location so stayed put unlike a Great Grey Owl that I had seen less than two weeks ago well Cross-country skiing in Algonquin Provincial Park, near Oxtongue Lake. 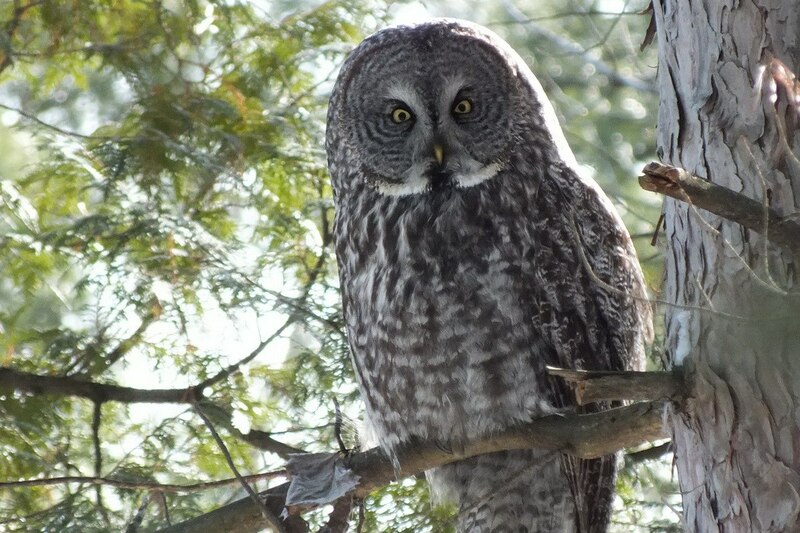 On that occasion, the Great Grey Owl flew in and landed on a branch above my head, took a good look at me, and then took to the air once again. So we were grateful for this opportunity to get numerous pictures of a member of the same species. The owl busied itself with preening as the warm breeze ruffled its feathers and the sunshine warmed its back. 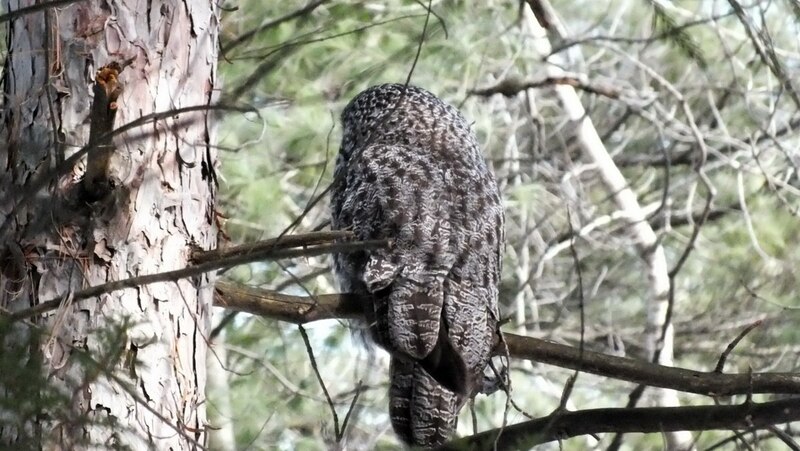 In this video that Bob filmed, you get a good opportunity to watch the Great Grey Owl preen its feathers. 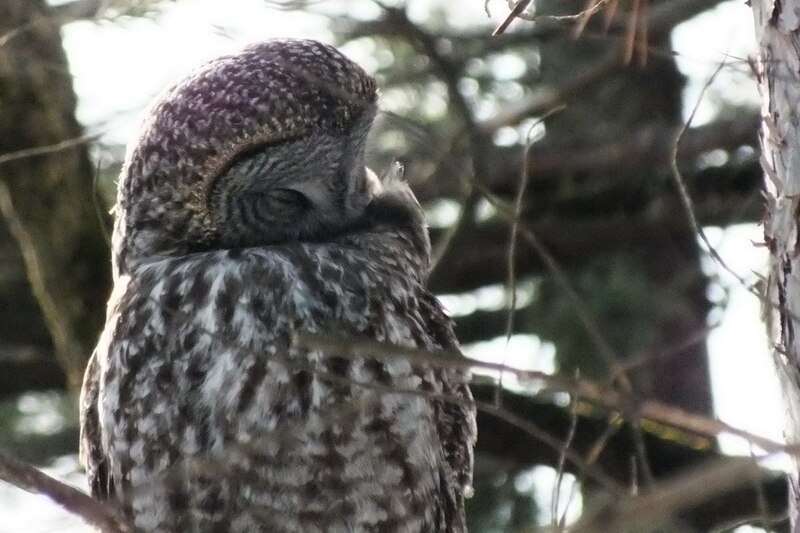 At one point, I had to chuckle as the owl appeared to cross its eyes, but before we knew it, the owl was settling in for a sleep. We left the owl at rest high up in the tree, most certainly getting ready for its next foray into a neighboring meadow where it will hunt meadow mice. This had been a glorious and very rewarding bird sighting for Bob and I. Cool owl shots! 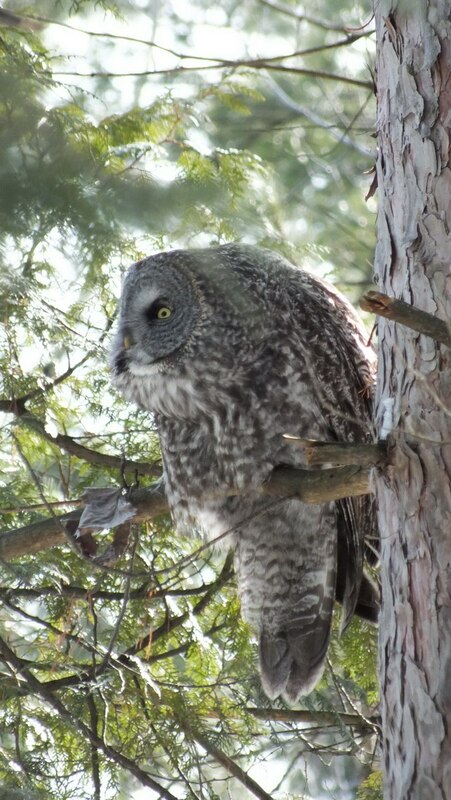 I love the owls and any sighting is great to me! I feel the same way. 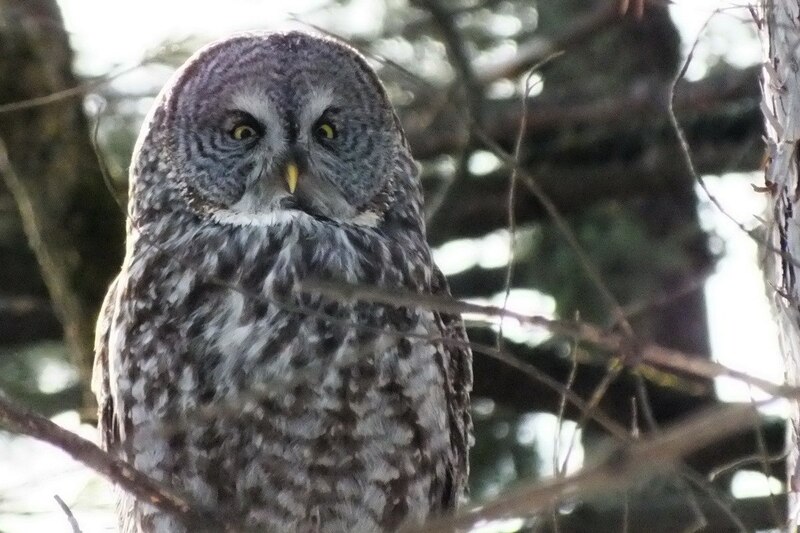 Up until this past few months, neither Bob nor I had ever seen any owls in the wild. As a matter of fact, we had thought them rather rare. 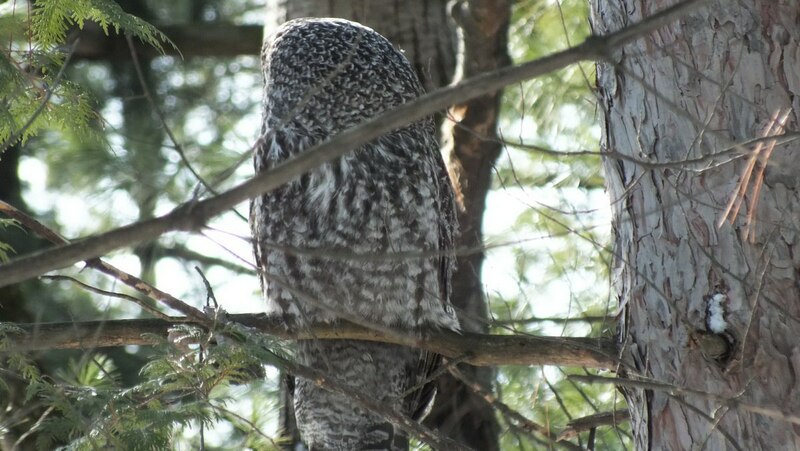 But with our increased awareness of sightings, and efforts on our part to get out into the forests, we are pleased to see that many different species of owls seem to be alive and well, if not numerous. It is really heartening! Screech owls are very difficult to find. They are small and hide deep in conifer thickets. They sound like a cat hissing, and they are terrified of great horned owls, because great horned owls will have for dinner anything they can overpower. In spring look for an abandoned woodpecker hole, a woodpecker will only use it once. Find what interesting birds have taken it over. I one time found an American kestrel, but also different types of owls will take them over too. thanks for the tips. We have yet to sight a Screech Owl of any kind. Interesting that you should mention how a woodpecker will only use a hole once as I had just learned that this morning when reading up about Pileated Woodpeckers. I was enthralled reading this and seeing your photos.You are truly inspirational in your blogs.Thank you Bob and Jean. It means a lot when you say that we are inspirational. Anything that we can do to raise awareness and appreciation for nature is a good thing. I think nature is amazing and awe-inspiring. 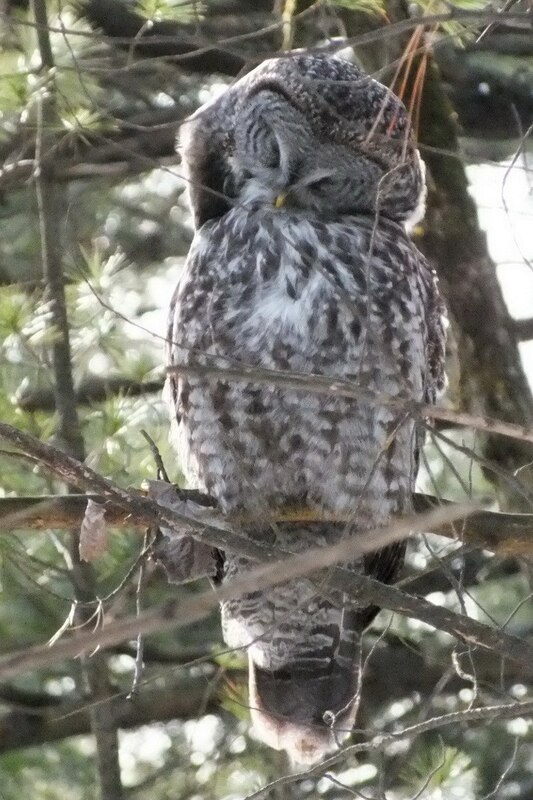 I hope there are lots of voles for that great grey owl to eat. 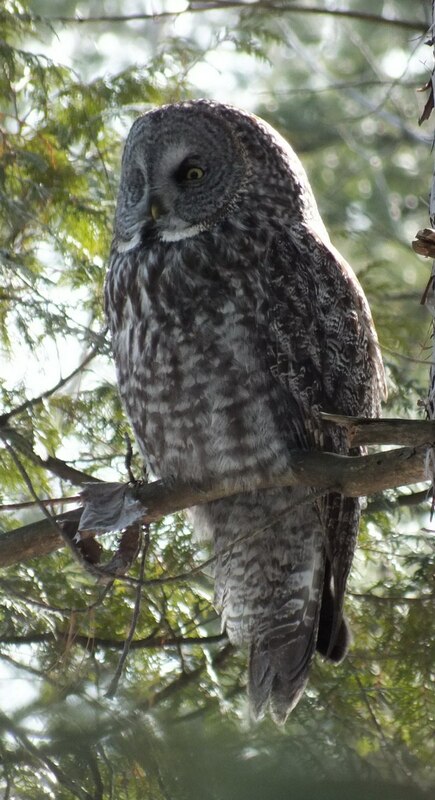 They are not generalist hunters, like the great horned owl is.